There are infinite subtleties of sound and vibration that play within the bodily field. Galaxies of the finest energies are scintillating within, waiting to be experienced as passageways to the most sublime harmonics of Love. Every movement, every breath, every posture of the body can be used as a magnetic attractor of the ecstatic bliss vibration! Even during periods of sadness, physical pain, anger and the myriad emotional states that are part of being human, the underlying bliss can be felt deeply when we allow ourselves to feel and embrace all aspects of our humanity, even those parts that may be uncomfortable to look at and acknowledge. In a very real sense, the body is a love/bliss attractor and generator. It is not just a physical place for the embodiment of the soul, but is also meant to be a doorway to the experience of Cosmic Love. When the bodily energies are in alignment with the universal currents of the bliss vibration, then it begins to dance like the leaves of the aspen tree quaking ecstatically in the wind. There is no impediment to this experience save in our own resistance to the depths of our own feelings. Afraid of vastness, terrified of primal nature, we seek comfort in controlled and familiar environments, not wanting to look into the abyss of our Infinite Selves. Where to begin? Sometimes I like to begin from stillness and silence, feeling the body as a vast field of vibration. Then, a gentle and exquisitely slow twisting of the spine with the awareness of each underlying vibration as they arise. As you continue paying attention to what comes up, at a certain point you may notice certain pleasant or pleasureable feelings arising, vibrations that are subtle and yet distinct. Pay special attention to these fine energies and then allow the body to adjust itself according to how it wishes to move. It inherently knows how to flow in ways that builds the magnetic field of the blissful vibration. This is surrendering to the flow of Cosmic Energy, getting out of the way of that which is our natural state of Being. Explore the finest nuances of the bliss vibration, following to its deepest source. As you continue to move and dance to this Divine Song, you are creating the geometries of Sacred Space within your body and in its environment. Understand that you are the portal to dimensions of indescribable Beauty! Play with the harmonics of Love. Every breath, every movement, every nuance of sound and vibration is an abode of Love! It is all feeling! The wind, the sky, it is all part of the pulse beat of Love, the breath of Bliss! Bliss is dancing in the ocean of the bodily field. Remain open to the cues that show up for you. Learn to just Be! The power of Being has an attracting force that is divinely magnetic and will draw to you all the circumstances and people necessary to manifest the desires of the heart! When I speak of “Child” I mean the inner archetype or energy of creativity that flows within. The inner child can also be our connection to the Mother/Father Divine. When we allow ourselves to merge energetically with the Child, the energy then wishes to express creatively through the unique channel of our lives. I use sound, voice (overtone singing), rhythm, dance, movement, art (writing and drawing), and playing music as a way for the creative energy to express. The more I allow (without mental editing or self-criticism), the more it begins to flow easily and effortlessly. The energy flow also becomes joyful, ecstatic, moving like nectar through the body. Learn to listen to your heart and body…without judgment, without story. Feel! Feel! Feel! Ask any body part what message it wishes to convey to you. Listen and feel. This vision has gotten very clear in the last year or so and it’s how I conduct my sound healing events. I have the participants sing and dance their prayers and intentions. It is just a matter of getting out of our own way. I did not take any special training to learn overtone singing. I taught myself by listening and feeling (on the inside). There are, however, recordings that can be found on Youtube (do a search for “overtone singing,” “throat singing,” and “Harmonic singing”). You can find lots of help with technique online… Have fun with singing (without pushing yourself). Learn to listen for subtlety…that is where the true power lies in overtone singing. Follow and listen for the subtle vibrations that dance within…they will awaken and help you move energy in the body. Most of all, have fun! If it’s not fun you’re trying too hard! It’s all a dance and play of energy. It’s like the human equivalent of a cat’s purr. The whole body begins to vibrate. I sing now (as much as I can) only with people that are open hearted and willing to play. When I do events, I take lots of time to bless the area of play and the individuals present. This is the blessing of “Sacred Space.” In this way, the Child feels safe to come out and play. When the Child comes out, many wonderful things can happen. The consciousness goes into deep trance and the vibration of love and bliss begins to be experienced. It is a thing of great Beauty and Enchantment! There are infinite dimensions of creativity that can be explored. Just get the energy moving without stopping to consider why you may be feeling a lack of inspiration. Start something…listen and feel deeply while expressing through your writings, drawings or music. There is no “stuckness” save in your own choice to not start the process. Once you allow and begin something creative, no matter how small or large, the momentum of creativity will begin to move of itself, allowing for tremendous bursts of expression. Step out of the way! Do not judge or question whether or not you are “good enough.” Create! Create everyday. Your life and Being is inherently creative. Allow the Divine to sing and dance through you. If you ever feel uninspired, that is a trick of the mind. Just start the process of moving energy and then inspiration will always be with you. It is as natural as breathing in and out. Feel and listen to the Spirit that lives within. You are Creativity. Live and breathe its Spirit. Receive and be filled with what is already yours and then give thanks that your consciousness can now understand and receive this! I would like to share with you something that has been extremely helpful in the creative work that I now do. 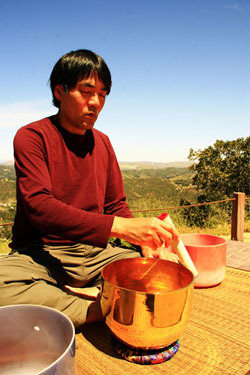 A number of you have asked how I came to embrace the path of art and sound healing. This post is about finding your way to your “Heart’s Virtue,” (also known as the unique gifts you were meant to manifest and express in life). Eight years ago, while still in the monastery and struggling with thoughts of leaving, I had no idea what my heart was calling me to do. I was in a “no-mans’ land” of ambivalence–feeling stuck. In other words, I felt paralyzed, not able to move forward and unable to embrace the life that I had been living for close to 20 years. Fortunately for me, in 2001 I began working with someone who became a coach and mentor to me. His name is Greg Mooers, founder of LifeCamp. He was a friend and fellow monk who left the monastery some years earlier and developed a successful career in coaching that pinpointed and clarified the “Heart Virtue” of one’s unique calling in life. In my experience with Greg and the process that we went through, I connected viscerally with my heart and received clarity for the first time regarding the gifts that I was born to express in life. I opened up to my “Heart Virtue” of “Creativity” and “Sacred Space.” It was a powerful awakening that had me gasping, “How is it that I did not recognize this until now!” When the heart opens up, it moves tremendous amounts of energy that reveals with clarity the gifts that you were born to express in life. My Heart Virtue of Creativity and Sacred Space is the “gasoline” that fuels all of my endeavors in life. That is my commitment to myself and to all of you. It is what moves through me with greater and greater momentum as I learn to step out of the way and allow it to flow unimpeded. As Greg’s work has been of such value to me and the work that I now do, I wanted to share this information with you. If you are seeking clarity about your most treasured desires in life, or if you wish to connect with what your heart is calling you to do (your Heart Virtue), then by all means check out Greg’s programs. If the timing conflicts with your schedule, and if you miss any of them, no worries! Greg will send you access to the recording. This tele-class series will show you how to thrive and implement the strategies now required in this rapidly changing world. Greg’s goal is to empower you in a new way to succeed in the face of new challenges. It will be an experience to start your 2009 in the best way possible . . .
I’m excited to also announce that in 2009 I’ll be participating in Greg’s workshops using the Sound and Harmonics tools that some of you are already familiar with. Please consider attending these workshops and give yourselves the gift of clarity!